Finally: The Ithaca Model 37 We Have All Hoped For? My history with the well-recognized name of "Ithaca" goes back as long as I can remember. I used to ask my great-grandfather, George Chamberlain Wakeman, what "his favorite gun was?" Great-Grandpa invariably replied, "I'd have to say that Ithaca." It was (and is) an old Damascus-barreled Ithaca Side-by-Side that Great-Grandpa hunted with year-round . . . as the modern innovation of "seasons" did not exist in Illinois back then. A commercial hunter and farmer, Great-Grandpa's first tractors replaced horse and plow to work his farm. He never did replace that Ithaca. John Browning (primarily) designed the Remington Model 17, made only in 20 gauge, which eventually became the Ithaca Model 37 around 1937. It was to be the "Ithaca Model 33 Repeater" of 1933, but though the Browning patent expired in June of 1932, a valid J. D. Pederson patent did not. The project was put on hold until the expiration of the John Pederson patent in October, 1936, and then the "Ithaca Model 37" was finally born. Right now, the Ithaca Model 37 has the distinction of being the longest-running pump-action shotgun made, eclipsing the Winchester Model 12 more and more with each passing year. The 37 saw service duty in both World War II and Vietnam, with its largest single user currently is reportedly the Los Angeles Police Department. The Ithaca Gun Company itself has changed ownership many times over these years. It shouldn't be a great surprise-- so has Browning, so has Winchester, so has Remington. Sometimes, you might think you need a racing form to keep up. It was Ithaca that introduced the "no-name" SKB shotguns to the American market, and Ithaca did the same with the "no-name" Perazzi. Ithaca itself floundered, though, and the Model 37 (renamed the Model 87 for a time) faded along with it. The quality of the later Ithaca product was "variable," to put it mildly. Ithaca came back on the scene, briefly, in King's Ferry, N.Y., with production that continued in fits and stutters until about 2005. When the Ithaca Model 37 was reintroduced in 16 gauge, I immediately bought one for myself direct from the factory. With a crummy, heavy trigger, a face-busting amount of wood on the comb, and the propensity to instantly unload the contents of its magazine on the ground it was of the most disastrous single-shots I've owned. Ithaca, at that time, was cursed with old tooling . . . with employees that reportedly made parts at home in their garages just so a few guns could get shipped. The King's Ferry, N. Y., Ithaca attempt ended finally-- likely a good thing. The assets were purchased (I'm not sure what they were at that point, other than a brand name) and Ithaca appeared again out of Ohio. Well, it seems that the new owners of Ithaca perhaps had more money than brains, and with no experience in the firearms industry they quickly failed. Just over a year ago, the new and current Ithaca Gun Company was established in Upper Sandusky, Ohio. David Dlubak and his investors sought to do things right, and to aggressively approach the firearms market. It seems that the new Ithaca understands that Model 37's, no matter how well made, can hardly support continued growth. In addition to the first-ever Model 37 28 gauge currently being tested by Ithaca and scheduled for a late 2009 early 2010 roll-out, we also have an all-American Ithaca O/U scheduled for end of the year 2010, a Model 37 16 gauge scheduled for 4th quarter 2010, and eventually a made in USA Ithaca Side-by-Side to follow in 2011-2012. A lot is happening at Ithaca, not as quickly as some would like, of course-- but most naysayers have never operated a gun company, either. Recently, happy to include the Ithaca Model 37 in a 20 gauge pump-action comparison, we found a "perfect storm" of sorts. The Model 37 as supplied had an overly heavy trigger, and failed to shoot to point of aim. The trigger was instantly rectified by Ithaca (apparently just two heavy triggers leaked out-- several dozen were caught before any shipment) but the stock issue was not quickly addressed, nor could it be. A good company can learn more from its "uhh-ohhs" than from its successes, though-- while some companies refuse to admit, much less address their problems. So, while the tested Model 37 was given a candid but unfavorable review, good things were in the works. That brings us to this review, the current production Ithaca Model 37 20 gauge equipped with a 26 inch barrel. The tested Ithaca has a clean trigger, breaking crisply at about 5 pounds right out of the box. The stocks have gone back to the "original original" Ithaca specifications, now having far more drop. They now have 1.5 inches of drop at the comb and 2.25 inches of drop at the heel (the first tested 37 20 ga. was 1.4 DAC, 1.6 DAH). The fine-line checkering has been replaced by more standard cut checkering, and the pistol grip cap that was pewter now distinctively says "ITHACA" in white lettering on its black oval. The well-fitted Pachmayr Decelerator pad remains. As soon as we through this Model 37 up to our shoulders, we knew we were going to like it. With no visible rib, it has as close to a perfect fit as can be hoped for, for most upland applications. The Ithaca has a 5 shot capacity, so the next move was to slide off the barrel and install the three shot plug to get us "Illinois pheasant legal." We grabbed Buddy, our impatient German Short-Hair, and headed to the field. Concerned about point of impact based on our previous testing, there was a quick first visit to the patterning board. Using the supplied and installed Ithaca Plus Briley Modified choke, we printed patterns at 40 yards with a variety of pheasant medicine, finding that yes-- the Ithaca shot where it was supposed to, right on the money at 40 yards with beautifully centered patterns. The Winchester 1-5/16 oz. #5 shot three inch shells (#STH2035) patterned superbly and evenly with the Ithaca modified tube, so they were the shells that we hit the field with. 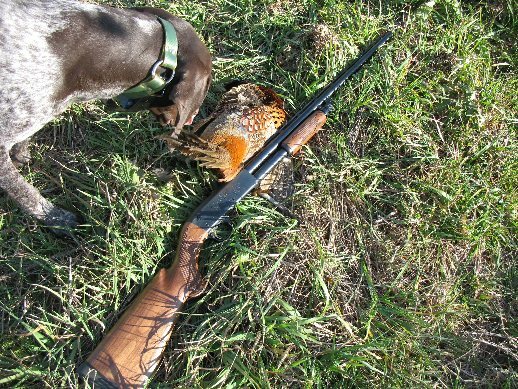 It wasn't that long until our pointer found a nervous rooster in the center of a thick waterway that hit the air at 40 yards cackling and hollering away along with a pair of hens. One shot from our Ithaca, and we had our first rooster. A couple of hours later, after flushing nothing but hens, our pointer locked up on our second rooster of the day, the one in the picture above, that we dropped at about 35 yards with a single shot. This gun hunts. We felt that the recoil from this Ithaca was extremely manageable. Though patterning these heavy loads crouched over bag and cradle at the bench gave us quite a jolt, the recoil wasn't even noticed from a standing position in the field with cackling roosters getting up. The Model 37 cycled effortlessly and smoothly, and we were quickly back on bird for a second shot-- which, in both cases, wasn't needed. Our daily limit filled, it was back to the range for more patterning and cycling testing. We found the Model 37 to be an exceptionally smooth and slick cycling repeater. If you are accustomed to pump-actions, you'll find that the Ithaca practically works itself. There is room for improvement in the Ithaca Model 37 as supplied, but not much. We are picky, and don't like the fact that the Briley chokes don't always fit perfectly flush with the muzzle, allowing a sliver of silver to jut out on the modified tube for example. It is cosmetic, not of functional importance as our patterning was able to show . . . but it isn't right. Flush chokes should be flush, or slightly recessed. Either Briley is making them too long, or Ithaca is ordering them too long. It needs to be fixed. We also found the Ithaca owner's manual, with overly dark pictures and lackadaisical text, to be one of the most poorly offered "manuals" we have seen in recent history. Please dispose of properly. While the basic stock dimensions have been changed to our satisfaction, the buttstock is a bit too thick for our tastes and could use a little slimming up overall-- particularly in the pistol grip area. Worthy of note is the Ithaca's "solderless" barrels. Where in most shotguns, the barrel lugs that the rib attaches to are soldered or even glued on, the Ithaca barrels have integral, machined in lugs that are a work of art. While on the subject of barrels, it is also worth noting that the Ithaca Model 37 has a threaded receiver and threaded barrels, just like always. It is more costly to produce, of course, than the slip / slop barrels you find on most pumps and semi-autos. However, it is a superior mechanical lock-up that helps account for the exemplary accuracy found in Ithaca Deerslayer models, for example. You won't easily find a bolt action rifle with a barrel that isn't threaded and headspaced, and if you want your shotgun to shoot as accurately as a rifle slip-fits can be considered lacking. The Ithaca barrels are positively located by metal against metal, not slip-fit with a loose magazine cap against wood, plastic, or a welded-on barrel ring. This is part of the appeal of the Model 37, along with its "from a solid block of steel" receiver. It is all likely far stronger than it strictly needs to be, but that is part and parcel of what build quality is all about. One of the benefits of dealing with a moderate-sized company like Ithaca is that the current Ithaca is well-suited to accommodate custom stock dimensions and upgraded wood. We've seen some of the high grade walnut examples from Ithaca-- and they are breathtaking. The tested gun was Ithaca's standard grade, still a very nice piece of walnut with distinct mineral streaks, the forearm and buttstock evenly matched in grain, color, and tone. As the importance of shotgun-fit is hard to ever-estimate, it will be a godsend to many shooters to learn that Ithaca is happy to take care of custom work right at the factory for them. What we finally have, at long-last, is the best Ithaca model 37 ever produced . . . a shotgun that lives up to its John Browning / John Pederson heritage. With tasteful, traditional-style cut engraving on the receiver, a jeweled breech-block, and excellent wood to metal fit and finish, it is the best-made American pump shotgun in the market. For that matter, it may be the best affordable American made repeating shotgun available today. We believe it is also an extraordinary value. Take a look at most any pump today, add in the cost of receiver engraving, a jeweled bolt, add a premium ground-to-fit recoil pad, highly polished blue barrel, add comparable wood and a grip cap. All of a sudden the new Ithaca starts to look more and more like a tremendous value. Do all that, and you still won't have the Ithaca solderless barrel system nor will you have a threaded barrel-receiver array. You likely won't have a five-shot capacity yet, either, and you sure won't have an Ithaca Model 37. Congratulations to the new Ithaca for quickly getting it right, despite only a year or so in business. We need more quality American gun-crafters, and Ithaca is on the right track. Maybe my Great-Grandfather was right after all when he said, "I'd have to say that Ithaca." Personally, I can hardly wait for the 16 gauge. For more information, see your local dealer or refer to http://www.ithacagun.com.